Former France youth international Yannick Aguémon, midfielder Rodrigue Kossi, locally-based Cherif Dine Kakpo and Patrick Sèdjamè have been handed maiden call-ups. The trio of experienced Stéphane Sessegnon, Sessi D'Almeida and Mickaël Poté are all suspended for the Group D encounter. In-form Huddersfield forward Steve Mounié is included and veteran midfielder Jordan Adeoti leads a cast of nine France-based players named by French coach Dussuyer. Benin - who held Togo to a goalless draw in the reverse fixture back in September - just need a draw in their final 2019 Nations Cup qualifier to book their place in Egypt. The visitors know that only a victory in Benin will help seal qualification for a ninth appearance in the tournament. 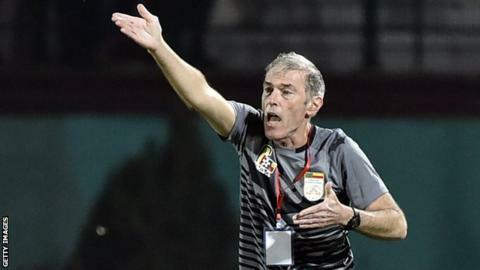 Group leaders Algeria have already qualified and play The Gambia who still have faint hopes of qualifying. Goalkeepers: Fabien Farnolle (Yeni Malatyaspor, Turkey), Saturnin Allagbé (Niort, France), Cherif Dine Kakpo (Buffles). Defenders: Junior Salomon (Plateau United, Nigeria), Olivier Verdon (Sochaux, France), Khaled Adénon (Amiens, France) Moïse Adilehou (Levadiakos, Greece), David Kiki (Red Star, France), Emmanuel Imorou (Caen, France), Rodrigue Fassinou (ASPAC), Seïdou Barazé (Yzeure, France). Midfielders: Rodrigue Kossi (Club Africain, Tunisia) Jordan Adéoti (Auxerre, France), Patrick Sèdjamè (Buffles), Mama Seibou (SC Toulon, France), Anaane Tidjani (US Ben Guerdane, Tunisia), Cèbio Soukou (Hansa Rostock, Germany). Forwards: Jacques Bessan (MO Bejaïa, Algeria), Steve Mounié (Huddersfield, England), Désiré Sègbè Azankpo (Senica, Slovakia), Jodel Dossou (Vaduz, Switzerland), Yannick Aguémon (OH Louvain, Belgium), David Djigla (Niort, France).